Ear injuries can be both debilitating and painful and may result from one traumatic incident or numerous smaller injuries suffered over many years. Conditions such as tinnitus can be maddening, and there is little that can be done to treat them. The Chicago hearing loss attorneys at Rosenfeld Injury Lawyers work tirelessly to recover tinnitus lawsuit awards on behalf of clients who have suffered these injuries due to defective safety products or poor working conditions and may be able to recover the compensation needed to provide some comfort and ongoing treatment in your time of suffering. We won't charge any fees unless we help you get a settlement in your Chicago hearing loss lawsuit. Airbags have been proven to save lives, but they are also linked to numerous vehicle recalls due to concerns over excessive deployment speeds and malfunctions. Data has revealed that the deployment of an airbag can cause irreparable damage to the ears, and many victims have suffered from hearing loss and/or tinnitus following an accident. Initial damage to the eardrums can heal in a short period of time, but scar tissue and damage to the inner ear may contribute to long-term hearing loss, especially at higher frequencies. Roughly 17% of those involved in an accident in which an airbag is deployed have permanent hearing loss. Many people suffer from some form of tinnitus at some point in their lives. It is a ringing or buzzing in the ear that occurs despite the lack of any actual sound, and it is thought to be caused by damage to the nerves in the inner ear that are responsible for transmitting sound and pitch to the brain. Tinnitus sufferers who have been injured in auto accidents or when their airbags deployed unexpectedly may experience more severe symptoms. The constant buzzing or ringing has even led some to take their own lives due to their inability to escape or drown out the sound. It can be more difficult to notice progressive hearing loss resulting from repetitive injuries to the inner ear on the job because the hearing loss is gradual, occurring over years rather than instantly. Loud environments, such as construction sites or factories, are often the cause of these injuries, but they can also occur when a worker is hit in the head or suffers a blow directly to the ear. A doctor can confirm whether an eardrum has been ruptured or if a victim has suffered an injury to the inner ear, but the treatment of scar tissue is difficult. Scar tissue inside the ear is most commonly associated with ringing or buzzing in the ears and long-term hearing loss. 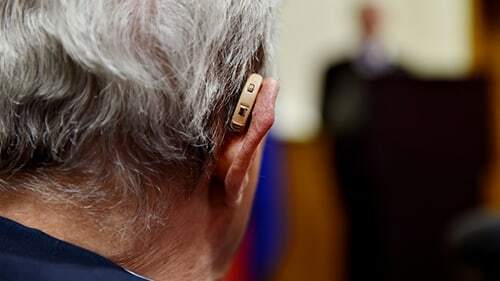 If you are suffering from tinnitus or hearing loss and feel that your condition is the result of an injury suffered in a car accident or due to your work, Rosenfeld Injury Lawyers can help determine the cause of your injury and work with you to pursue a hearing loss lawsuit. Contact us today to schedule a free consultation with one of our award-winning Chicago hearing loss lawyers so that you can learn more about your legal options and how we can assist you in securing the compensation you are entitled to for your injuries. We've helped thousands of clients in similar cases and are confident that we can help you, too. If we are unable to, then you won't pay a dime.